I’ve been doing my best the past year to try and get out more. I was invited to a small winter camping event in upper Minnesota! It an attempt to be brief and let the photos do the talking: It was a 9 hour drive, first night was -10F second night was -14F, 9 hour drive back. Sleeping in a hammock with great down quilts is the best at any temp! Snowshoeing in traditional snowshoes is tough, but a requirement in soft “float” that’s knee deep at best! It was a tough weekend, but we had good support from some very experienced outdoorsman, we had a warm tent in case of emergencies, and being well equipped and knowing how to build a good fire made this a great weekend. I’d absolutely do it again! Everyone getting unloaded. It was a 45 minute 4X4 drive from the farm we parked our 2 wheel drive cars at, then another mile snowshoe through the woods to the spot we picked for our campsite. 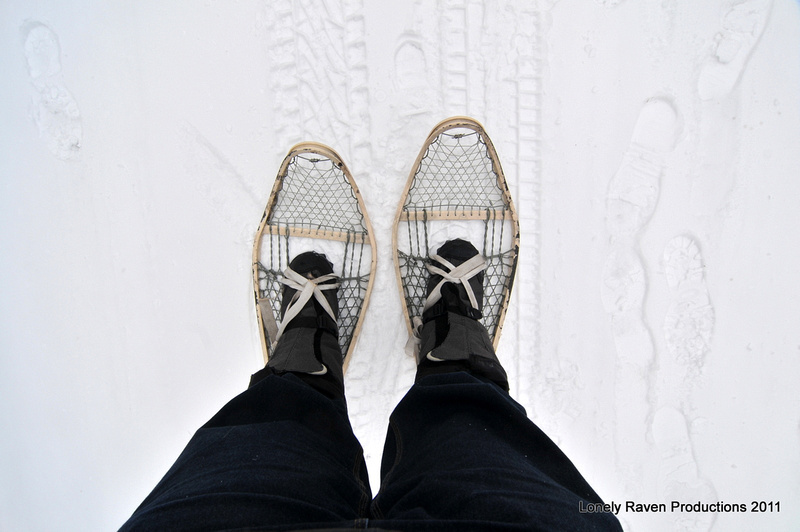 My first time in Snow Shoes – and Traditional Snow Shoes on top of that! Some people even made their own gear out of traditional materials to try out. At least my heads warm! Crummy photo of my setup. I was tired after a 9 hour drive, 45 minute 4X4, then 40 minute snowshoe. This is my winter tarp I made, my hammock with down insulation below and inside, and my pulk (sled) stashed inside as it was just starting to snow. No time to nap though, need to setup camp! To help block the wind, we setup a parachute between trees, and put up a couple emergency (reflective) blankets up on the north side where the wind was blowing in from, and built a small fire in the middle. The “hot house” which is for emergencies, cooking, and drying out any gear that may have gotten wet. The area we are in is surrounded by water and beaver dams. During our march through the trails, we could hear water running under the ice/snow just a few feet off the path. Only two people needed the hot house over the weekend, and one wound up going home early. We still wound up cooking over an open fire….hmmmm, bacon on a stick! Seriously though, the butcher fresh bacon was smoked over the open fire for aboout 3-5 hours and we’d just grab a piece in between gathering wood and other camp chores. That was some of the best bacon I’d ever had. Evar! I did some exploring and photos. The Nikon held up like a champ, never giving me any issues! The batteries and 3rd party lenses on the other hand were a challenge. Anything that could be affected by the cold had to be kept on your person, in your jacket(s) at all times. So I had cell phone (for emergencies though were were hell and gone from any cell reception), spare cell battery, two Nikon batteries, toiletries, food, tinder, and water all stuffed into my sweater and jacket. Anyways, this photo was taken just a little bit before noon. I was surprised by how low the sun was at this hour! We had some serious frost issues from the moisture coming off our bodies, and our breath. I had to hang all my down gear in the sun to dry out every morning, otherwise the down would get plugged up with ice and not be terribly warm. Snow piled up along the edges of my tarp helped keep the wind from ripping through and stealing all my warmth. We also had some “classes” on emergency shelters, fire building, and general bushcraft. In this photo we were working on a “super shelter”; which is a fire built outside of a plastic drop cloth shelter with an emergency (reflective) blanket as a back wall. It creates a (smoke free) greenhouse that was about 40F compared to the -1F outside. 40F doesn’t sound like much, but I assure you, it’s all relative! Everyone who popped into the hammock in the super shelter started to nod off almost immediately. Ahh, outdoor comfort! Beer, coffee, and cowboy chili made over the open fire! We certainly ate well since we all pitched in some food, and had fresh meat provided by local hunter. Some crummy sky shots. I couldn’t get over how beautiful the stars were this far north, and without direct light pollution (though there was still some). It was tough to get these shots at -10F as the gear lube in the lens was freezing and turning into snot, the tripod legs froze stuck in position, and I needed to have 1 to 2 *minutes* shutter exposure. So there is blurring from the earth moving during these long shutter times. Still, I like what I got. Look at all those stars!! This was a post in forum from early last year, I thought I’d resurrect it here at FST to help kick off some articles on Hammock Camping, Down vs Synthetic gear, Camp Stoves, and general Out-of-Doors endeavors we get into around here. Please comment if you have any questions or something specific you want us to write out.